The Raspberry Pi 2 includes a quad-core Broadcom processor, a dual-core GPU, and 1GB of SDRAM memory. Compared to its predecessor, the "Raspberry Pi B +", the dimensions of the board (86 x 56 x 20 cm), the location of the interfaces and the wiring of the GPIO pins have remained the same. This means that both enclosures and extensions can usually be reused. Raspberry Pi is a mini computer, which is very cheap and costs about 40 euros. 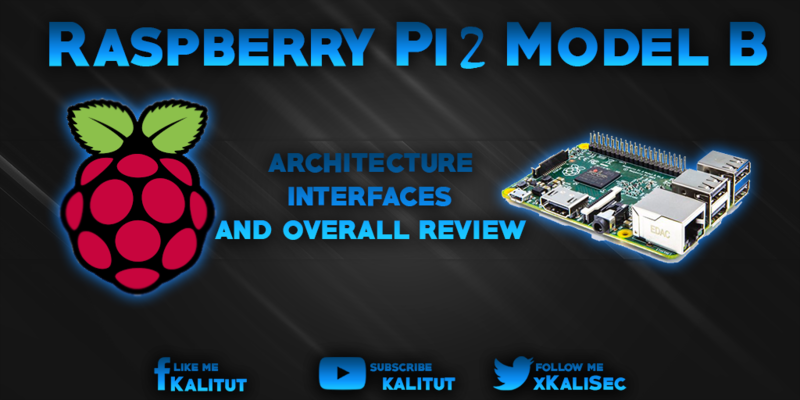 The model "Raspberry Pi 2 Model B" is a continuous development of the predecessor models "Raspberry Pi B and B +". Raspberry Pi 2 includes a quad-core Broadcom processor, a dual-core GPU, and 1GB of SDRAM memory. Compared to its predecessor, the "Raspberry Pi B +", the dimensions of the board (86 x 56 x 20 cm), the location of the interfaces and the wiring of the GPIO pins have remained the same. This means that both enclosures and extensions can usually be reused. If you are not sure if you have a "Raspberry Pi B +" or a "Raspberry Pi 2 B" you will find the label "Raspberry Pi 2 Model B V1.1" underneath the GPIO pin header. In addition, the processor must have the Broadcom logo printed on it and the memory must be on the bottom of the board. The real peculiarity of Raspberry Pi 2 is not its improved hardware features, but the possibilities it offers. Thanks to the ARMv7 architecture, more operating systems can be used. For example, Ubuntu and a special version of Windows 10 (from autumn 2015). Micro USB socket for power supply with +5 V / 2 A. As far as the energy and power consumption is concerned, Raspberry Pi 2 B is hardly different from Raspberry Pi B +. Raspberry Pi 2 consumes more power only under high load. An often criticized point is the low processing power of Raspberry Pi. This has improved a lot with Raspberry Pi 2. With the Pi 2, applications that employ only one core are only slightly faster. Only applications that can distribute tasks across multiple cores are up to six times faster. Already due to the change from ARMv6 to ARMv7 one can expect a performance increase. Simply because the ARMv7 architecture works more effectively. Of course, processes that support multithreading also benefit from all 4 cores. And the extra RAM is also a bit positive. How much the performance improves depends essentially on what you do. A general statement regarding the performance cannot be made. But the fact that the Pi 2 is faster than its predecessors is obvious. Windows 10 for Raspberry Pi 2? After the introduction of Raspberry Pi 2, Microsoft has announced that it will give Windows 10 for free for Raspberry Pi. This controversial announcement was misunderstood by many. As part of the developer program, Microsoft offers a special version of Windows 10 for the Maker scene to spread Windows in the "Internet of Things". It will be available as Windows 10 for Raspberry Pi 2, but not as a desktop version, but only what is offered as part of Microsoft's IoT platform. Since Raspberry Pi 2 is based on an ARMv7 CPU, the old images can only be used conditionally before 31.01.2015. If you want to use an older image in a newer Raspberry Pi, you have to boot it in an older Raspberry Pi from a MicroSD card and perform an update. A new firmware and a new kernel and for ARMv7 are automatically imported. Then you can use the image in a new Raspberry Pi 2.